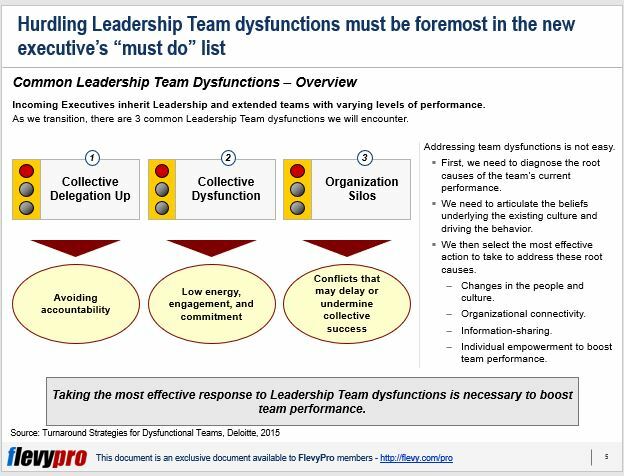 How Can We Turnaround Dysfunctional Teams? This can be a challenging dilemma when management is increasingly confronted with a volatile, uncertain, complex, and ambiguous (VUCA) business environment. Surviving a VUCA environment requires a “dynamic team” that strikes towards a common direction in unifying action to achieve one purpose. In today’s world where competition has become stiffer, sharper, and rough, the importance of having High-Performing Leadership Teams” has come to a fore. Never shall executives allow dysfunctional teams to continue as deadwood that barely keeps our heads above water. In 2011, LeBron and his Miami Head “team self-implode during the 2011 NBA finals. The ESPNS poll showed that 49 states in the U.S. wanted to see Dallas beat Miami. The lesson was pretty obvious. The NBA finals showed that dysfunction within a team, regardless of the level of talent of the individuals, inhibits organizations from reaching their goals (in the case of the Miami Heat, an NBA championship). The good news is organizational dysfunction can be corrected by understanding the underlying causes that prevent teams from working as one. Having a good understanding of common leadership team dysfunctions and the underlying causes that led to the creation of deadwoods in organizations can give Executives a better handle of rallying the troops to fly high. A team that “delegates up” decision is unwilling to make and own its decisions. This can be a limiting factor to Executives wanting to focus their energies on strategic issues. The team cease to be a tactical resource an Executive can tap to achieve planned results. Worse, a collective delegating up can create a culture of fear where team members become static and poor performing. Inheriting a low energy, poorly engaged, and not committed extended Leadership Team is like an Executive hitting a blank wall. A common brand, goals, role clarity, and group processes have not been established in forging the team. As a result, members are not actively involved in important decisions during meetings. Credibility is lost more so when mediocrity is promoted and “yes” people are elevated to higher positions. During transition, Executives may inherit hierarchical and siloed organizations. 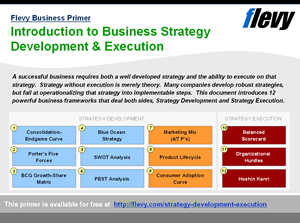 The Silo Mentality as defined by the Business Dictionary is a mindset present when certain departments or sectors do not share information, goals, tools, priorities, and processes with other departments. Silo is a business term that has been passed around and discussed at many board room tables over the last 30 years. This traditional model of organization can lead to delays in decision making, lost opportunities, and erroneous non-adaptive responses to shifting business environments. Existence of dysfunctional teams indicate the presence of ineffective management system in companies. It has created a culture that is not supportive towards the attainment of its goals and objectives. Coming up with the appropriate Team Turnaround Strategies is necessary. Foremost in the priorities of the company is to diagnose the situation and determine the factors that have detrimentally contributed to its development. Appropriate diagnosis will then effectively guide our company in identifying the appropriate strategy necessary for specific team dysfunctions. 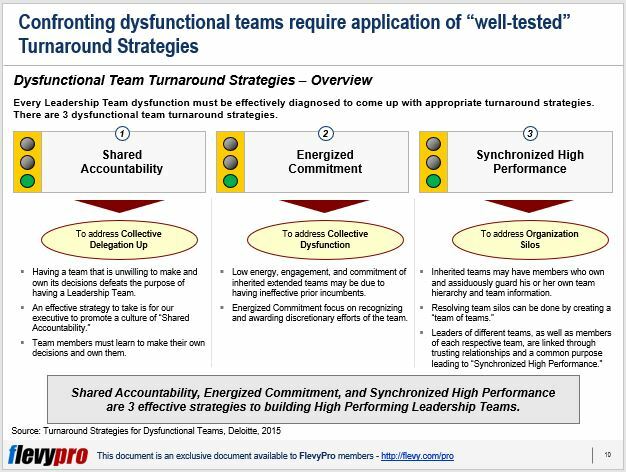 There are 3 dysfunctional Team Turnaround Strategies, each addressing a specific dysfunction. A culture of Shared Accountability must be created where team members can vigorously debate issues and make choices by themselves without fear of retribution. Culture change is not easy. Hence, a more systematic approach is necessary to engage and facilitate culture change. Culture change must be promoted and celebrated when members display decision making behaviors necessary to achieve Shared Accountability. Turning around a low energy, poorly engaged, and not committed team is not easy or instant. This can be a challenge specially if it is the collective belief of the team that needs to be changed. The Executive must be able to determine the root cause of the team’s belief and behavior to be able to turnaround the team. 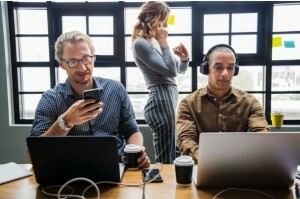 A collective dysfunction can be turned around into an “Energized and Committed Team.” Our company must be able to recognize discretionary energy and efforts. It is necessary that the Executives must be able to visibly demonstrate, communicate, and reinforce this to the team. Resolving the conundrum of organization and team silos can be best done by constructing “team of teams.” Organizing “team of teams’ can dramatically improve strategic and operational capability of the organization to substantially scale up performance. 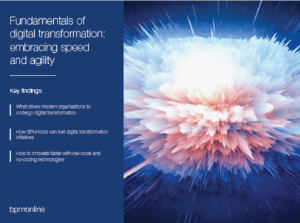 Achieving synchronized performance requires change at multiple levels in what the team believes and how they are organized. 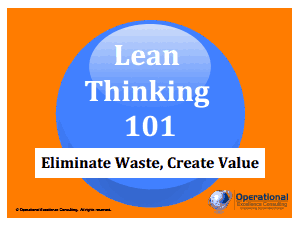 Interested in gaining more understanding on how to turnaround dysfunctional teams? 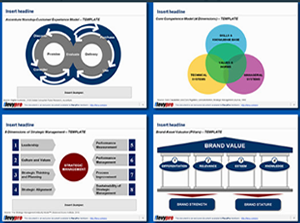 You can learn more and download an editable PowerPoint about Team Turnaround Strategies here on the Flevy document marketplace. Are You Familiar with the ADKAR Change Management Model? How Can You Experience Growth by Leaps and Bounds?